It’s been a long time coming, but we’re finally announcing the big spring event we’ve been planning for the last 4 months. As you may recall, the Awesome Foundation Edmonton awarded Jason $1000 after he pitched the WordCrawl idea to them back in December. His original idea was to unite members of our city’s literary arts community with local independently owned and operated businesses willing support and encourage them, as well as provide a showcase for both established and up-and-coming talent in Edmonton’s literary arts scene, then fuse that with the party spirit of a pub crawl. We’ve taken the seed money that Awesome Edmonton gave us and used it to put on WordCrawl, the first event like this the City of Edmonton has ever seen. We are also currently in the process of registering as a non-profit community organization, which means that any and all proceeds from WordCrawl 2012 will be funnelled back into staging more fun and unique events like this designed to help Edmonton’s literary arts community expand and increase the profile of talented writers, songwriters, poets, and performance artists from our city, making it a vibrant part of Edmonton’s night life. We also have plans to release annual self-published collections featuring content from the writers who participate in our events. We’ve spent the last four months securing venues and performers, and we’re finally ready to start selling tickets. Both Jason and I have worked hard to bring something fresh, interesting, and fun to the city’s literary arts calendar, and we hope you will agree. 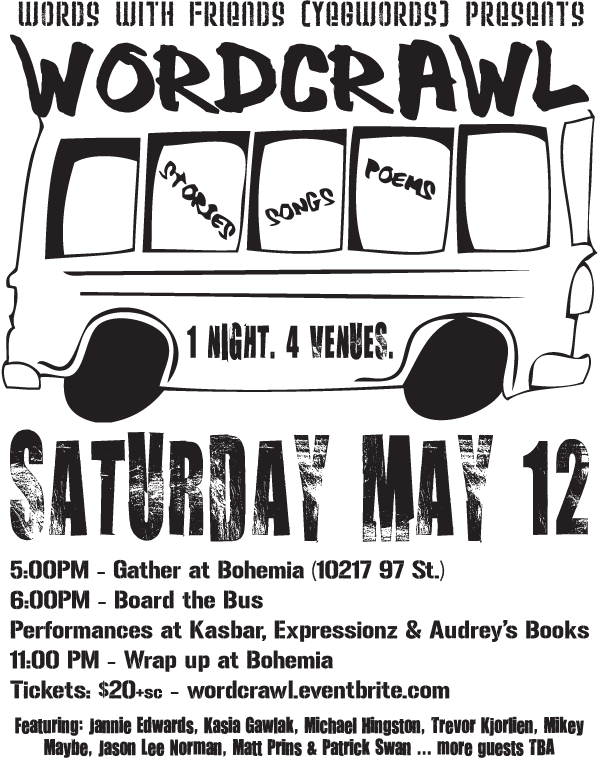 We’re both really excited to be working with the venues we are, including Bohemia — who has been with us from the beginning — as well as Kasbar, Expressionz Cafe, and especially Audrey’s Books, who is allowing us to use their lower floor as a private reading theatre for the evening. Audrey’s has an excellent reputation for supporting local authors, and performances there will feature author and poet Jannie Edwards, who was recently shortlisted for the 2012 Alberta Literary Awards James H. Gray Award for Short Nonfiction. I’m very much looking forward to meeting her. I’m also really pumped about the Literary Cage Match, which will kick off the performances at Kasbar. Perennial yegwords and Story Slam favourite Matt Prins will go head to head (to head) with recent Story Slam winner Trevor Kjorlien, and Michael Hingston, who runs the literary blog Too Many Books in the Kitchen, to see who can come up with the funniest story of the night — in the opinion of judges Kathleen Smith (KikkiPlanet.com) and Adam Rozenhart (The Unknown Studio). This is the first time that yegwords has ever done anything remotely “competitive”, but the guys are playing for bragging rights only, as well as the wild applause. After that we’ll be moving on to Expressionz Cafe, where poet and 2006 Spoken Word Canada Slam Champ Patrick Swan and rapper Mikey Maybe will perform. The evening will continue to Audrey’s where Jason and I will join Jannie Edwards in readings, and we also hope to add a couple more names to that slate as well. We’ll keep you posted. Things will wrap up back at Bohemia, where people can either bow out or keep the party going. It wouldn’t be a yegwords event without imbibing, so the price of your ticket includes one alcoholic beverage of your choice at the Expressionz performance, complementary wine bar at the Audrey’s reading, transportation for the evening, and possibly a beverage at one of the other venues as well (we’re still working out a few details). Tickets are $20 + sc and are available through EventBrite, as well as directly through Jason and I. If you want to buy a ticket directly from one of us, e-mail us, tweet us, Facebook us, stalk us in the LRT station, whatever. Tickets purchased directly through us have no service fee attached. If we don’t sell out by the day of the crawl, tickets will be available at the door, but we only have 40 spots available, so it’s probably best not to take chances. You can also RSVP on Facebook. I’m very excited about this event and incredibly proud of us for realizing this idea to fruition. I want to thank Jason’s girlfriend Lamya for all her help in organizing this, as well as Kathleen and Adam for volunteering to participate. We also want to thank the Edmonton Arts Council and Valley Liquor House (10824 102 Ave.) for sponsoring this event. I hope you will all come out for a fantastic evening of arts-inspired fun.